The calligrapher and printer Osman Zeki Bey’s birthdate is not known but it is estimated that he was born in Safranboul, near Zonguldak, in 1830s. His grandfather was an engraver, his father as well as his father in law were both calligraphers of their time and so was Osman Bey. At an early age he got interested in printing and started a little printing office. In 1960s he printed the Embassy Notes of Yirmisekiz Mehmet Çelebi (who was an Ottoman Envoy to Paris in 1720-21) and the Travellogue of his son Mehmet Said Efendi, one of the two founders of the first printing press (1723) of the Muslim Community in the Ottoman Empire! Osman Bey was working in the Palace of Sultan Abdulhamit II as his First Vice Chamberlain. The Sultan had been familiar with him since his childhood. Osman Bey was soon given the title of ‘Serkurena-i Hazret-i Şehriyari’ (Honorable and close to the Sultan)! As the Sultan trusted him very much he commissioned him to print the Quran, the holy book of Islam in his printing office. This was a permission that had been denied to Mehmet Said Efendi and İbrahim Müteferrika, the two founders of the first printing press in 1723. Osman Bey enlarged his printing office, bought new equipment and started printing the Quran in lithography, with the calligraphy of Hattat Osman, a famous Ottoman calligrapher. The products were strictly controlled by the ‘ulema’ (experts) of the Palace and Osman Bey was given the monopoly of printing the holy book (in 1878). He sold the Quran editions to the whole of the Muslim world and got quite wealthy in a short time. 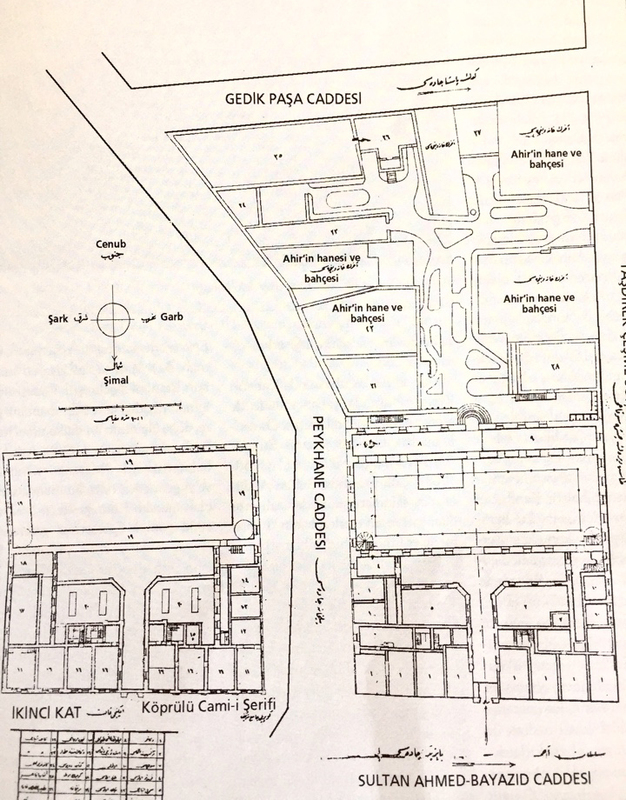 With the gain he made he bought a large plot of land at the outskirts of Istanbul and built houses for his six children: Cevat, Ōmer, Sabiha, Fitriye, Nudiye and Saim, three sons and three daughters. That area where till then mainly Greek and Armenian populations were living soon became a cosmopolitan settlement for different communities and started to be called ‘Osmanbey’. Now it is one of the main residential and business centres of the city. A columnist of the Greek Newspaper Episteyrisiyi visited Istanbul in 1888. He wanted to see the 'Matbaa-i Osmaniye', Osman Bey’s printing office as he was interested in the printing offices and wanted to compare this office with the ones in Athens. He was extremely impressed by what he had seen. He praised the equipment of Osman Bey’s printing office and the printed issues of several books, as well as the generosity of the administration towards their personnel, and their modesty. In 1902 Matbaa-i Amire, the printing office of the State was closed and ‘Matbaa-i Osmaniye’ took over all the printing jobs of it. In the Turkish National Library there are more than 1000 titles that were printed in that printing office in various languages, Turkish, Arabic, French and German. After the death of Osman Bey in 1890, Cevat Bey and Saim Bey, his two sons took it over. 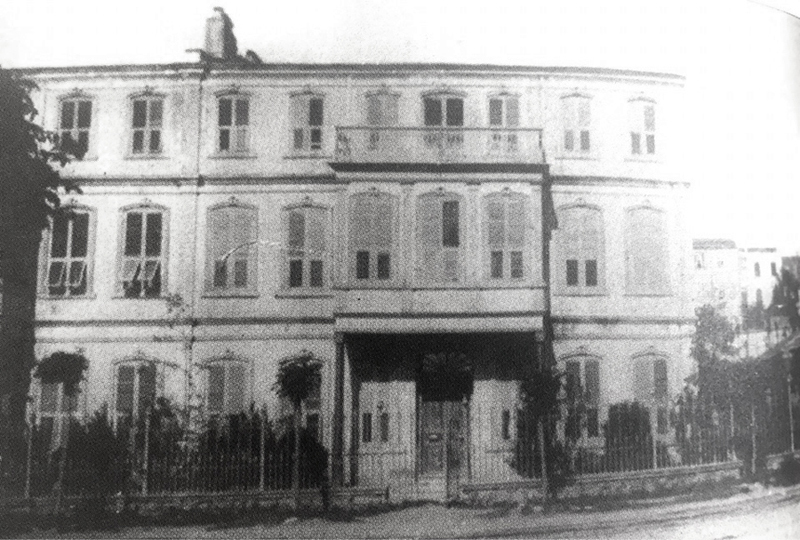 The printing office was closed in 1930 after Saim Bey’s death and Darüşşafaka, a charity organisation built a cinema on its site in Çemberlistas. ‘Matbaa-i Osmaniye’ was certainly a great contribution of Osman Bey to the Ottoman culture and education. From the front pages of the books published in this printing office we also learn that he was concerned about the ‘copyright issue’, which should also be considered a very modern issue also in Europe in those days! Osman Bey received several silver and gold orders from the Palace because of his good services to the State. Recent research has also revealed Osman Zeki Bey had also founded a paper mill in Beykoz, a small village along the Bosphorus, in 1893. It is quite logical for a printing press owner to have such a mill that would produce paper for printing and other purposes! Emre Dōlen who had been writing the history of paper manufacturing in Turkey for the Seka Musuem in Izmit discovered that Osman Bey had been commissioned by the State to set up a paper mill in 1886 and did it with the support of the State and Englishmen who wanted to invest in that lucrative initiative. 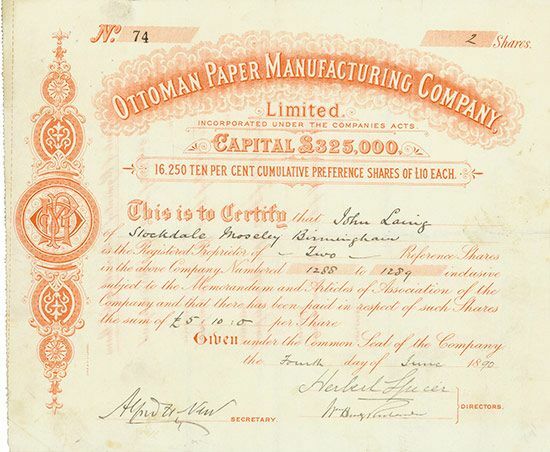 He also set up a Company entitled ‘Ottoman Paper Manufacturing Company’ related to that venture. The equipment of the factory was imported from the British firm Masson Scott and Inc. Co. however, at the time in which the Ottoman Empire was in a very vulnerable political state and with the poor economic conditions the factory could unfortunately not survive and its company got dissolved in June 1898. Nedret Kuran’s research on this topic is ongoing at the British National Archives and will soon be finalised with two books to be published, one in English and one in Turkish. 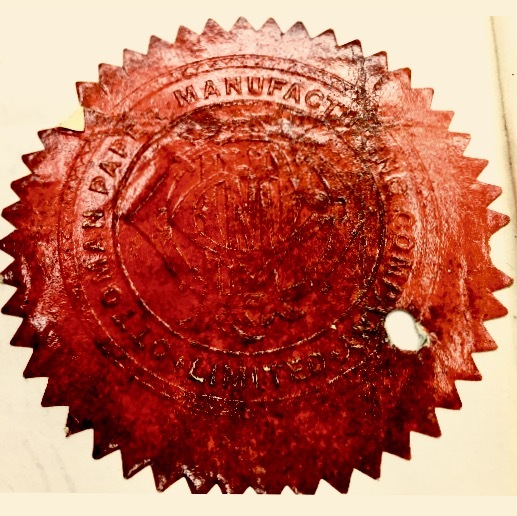 The seal of Ottoman Paper Manufactoring Company - copyrighted, cannot be used elsewhere. 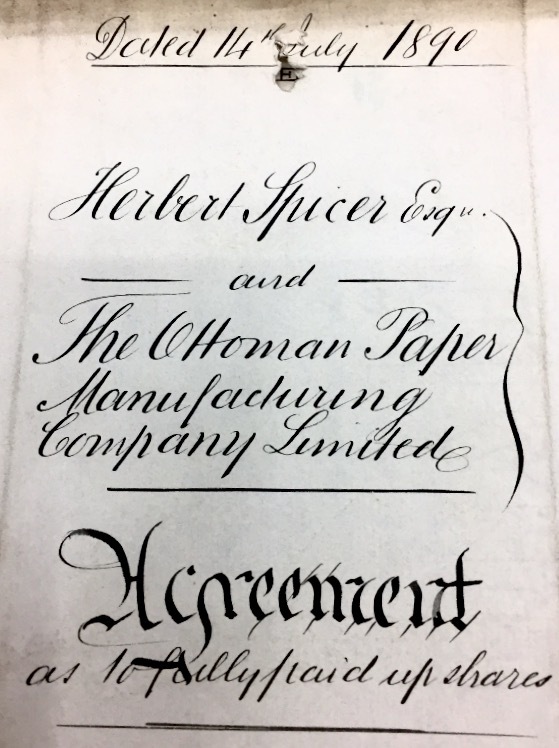 The Agreement signed in London in 1893 by the Administrative Council of the Company in England - copyrighted, cannot be used elsewhere.